Your submissions have been received and distributed to the judges. Thank you for sharing your words of wisdom with us. We will treat them with the greatest care and respect. God willing, look for the winning post here on Easter Sunday. Posted in Uncategorized on March 25, 2019 by Katie Schuermann. Andy Bates and Sarah Gulseth of KFUO Radio’s “The Coffee Hour” chatted with us last week about our Lenten writing contest. Listen here for details on what we’re looking for in your submission on the prompt, “I waited patiently for the LORD; He inclined to me and heard my cry” (Psalm 40:1). Remember, this contest is for anyone who breathes, has chromosomes, and reads the Bible. 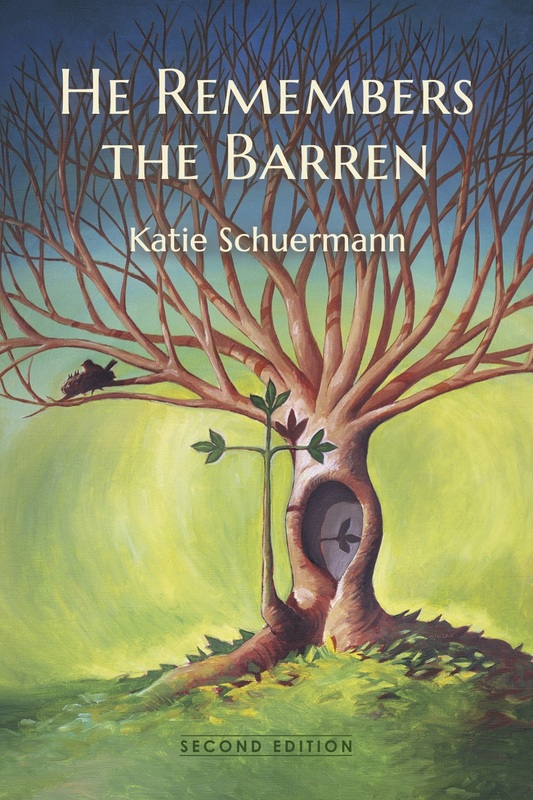 Submit your entries to katie@katieschuermann.com by noon on March 25th to be considered for the grand prize: a museum-quality giclée print (14.7″ x 18″) of artist Edward Riojas’ cover art for the second edition of He Remembers the Barren. Posted in Abortion, Adoption, Church, Foster Parenting, Grief, Marriage, Men, Miscarriage, Parenting, Secondary Infertility, Suffering on March 6, 2019 by Katie Schuermann. He snuck up to my table when no one else was there. He paused, so I waited. I wasn’t quite certain what part of my presentation had resounded with him, and I didn’t want to assume. Something happens in my cheeks whenever someone tells me this. I don’t know what it looks like from the outside, but from the inside, it feels as if my skin releases from my muscles, as if my cheeks — in dutiful obedience to the speaker’s command — move into proper riverbed formation to direct the flow of any incoming tears. My breath caught in my throat. We looked at each other, and I debated whether or not to say it. What if I made things worse? He smiled and wiped a lone tear from one of his own riverbeds. Then he told me stories. Stories about his work, about the many miscarriages his wife suffered after Sarah, about the way the children in his church would come up and start talking to him — “It hasn’t all been bad,” he assured. — about his love of working with wood, about how he made his wife’s casket when she died. I don’t know how that gentleman felt when he eventually walked away from me, but I felt thankful that Sarah had — has — a father such as him to remember her and miss her and love her still. 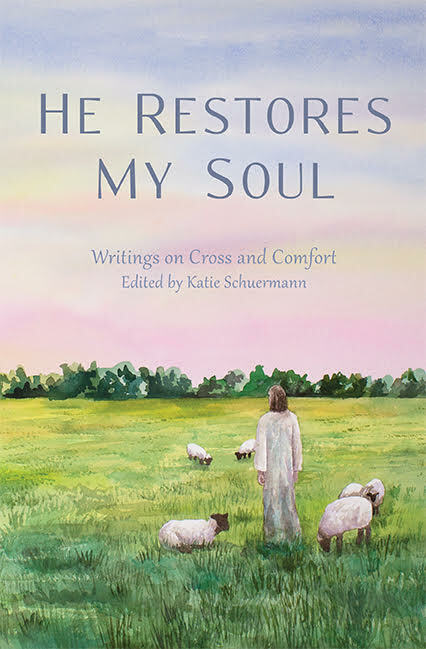 Posted in Grief, Marriage, Men, Miscarriage, Suffering on September 17, 2018 by Katie Schuermann. Special thanks to Katy Cloninger for today’s guest post. Her words of empathy, compassion, and truth are a welcome start to the day. What does it mean to be barren? Merriam-Webster coldly and bleakly defines it as “incapable of producing offspring,” or “not yet or not recently pregnant.” But on a personal level, there are as many kinds of barrenness as there are barren women. Some women fall into what may be called the classic category: they have never been able to get pregnant, no matter how much they try to “take charge of their fertility.” Others have been able to conceive but not to carry a child to term. Yet others have carried a pregnancy to term, but the baby was stillborn. Lord, have mercy on us all. Other women suffer from secondary infertility. They have had one or more children, but for whatever reason, or no apparent reason at all, they cannot have any more. Such cases are made even sadder when the one child a woman has is taken from her by SIDS or some other tragic circumstance. Lord, have mercy on us all. There are women who have had abortions before they knew the value of life, or knew it but were coerced, and the procedure took away not only the child they had but the ability to have children later on. Or perhaps some other surgery, necessary to preserve their own life, robbed them of the ability to bring more life into the world. Lord, have mercy on us all. Then there are those women who never found a suitable husband, though their greatest desire was to be a loving wife and mother. Others have found husbands, but their husbands have turned out not to want children, or there are difficulties consummating the marriage, or their husbands have abandoned them, terminating all dreams of a happy home full of children. Perhaps the husband is the sterile spouse. Or perhaps the husband met an untimely death, leaving his young and hopeful wife a widow in her prime childbearing years. Lord, have mercy on us all. No doubt there are many more kinds of barrenness than I have named. And for every person touched by barrenness, the individual details and complications add layer upon layer of sorrow and grief. Often we feel completely unique and alone in our pain. But that feeling is a satanic lie, for the Bible tells us so. “Surely He has borne our griefs and carried our sorrows,” Isaiah prophesies of Jesus, “yet we esteemed Him stricken, smitten by God, and afflicted” (Is 53:4). This Jesus, the Son of the Virgin, indeed “grew up before [the LORD] like a young plant, and like a root out of dry ground” (v. 2), for the very purpose that He would be “despised and rejected by men, a man of sorrows and acquainted with grief” (v. 3)—for us and for our salvation. Though our suffering is unique in some ways, it is common in that we all suffer the effects of sin; we all suffer the death-in-life of existing in a fallen world. We need a Savior to come and suffer for us the true forsaking of God so that we can be assured that God will never forsake us (Heb 13:5). But because we are in Christ, our suffering leads ultimately to glorification. St. Peter instructs that “those who suffer according to God’s will entrust their souls to a faithful Creator while doing good” (1 Pet 4:19), and to “rejoice insofar as you share Christ’s sufferings, that you may also rejoice and be glad when His glory is revealed” (v. 13). St. Paul picks up on the same theme. He reminds us that we are “heirs of God and fellow heirs with Christ, provided we suffer with Him in order that we may also be glorified with Him” (Rom 8:17). Paul later adds that “those whom [God] foreknew He also predestined to be conformed to the image of His Son” (v. 29)—an image that is first cruciform, and only later glorified. Nevertheless, Paul comforts us that our sufferings are brief and, with Peter, he encourages us to await the revelation of God’s glory in our now-broken selves: “For I consider that the sufferings of this present time are not worth comparing with the glory that is to be revealed to us” (Rom 8:18). Our glorification is so certain that Paul can speak of it in the past tense: “those whom He predestined He also called, and those whom He called he also justified, and those whom He justified He also glorified” (v. 30). Even now, Paul tells us, the Holy Spirit is bringing forth fruit as we suffer; we can “rejoice in our sufferings, knowing that suffering produces endurance, and endurance produces character, and character produces hope, and hope does not put us to shame, because God’s love has been poured into our hearts through the Holy Spirit who has been given to us” (Rom 5:3–5). In our present vale of tears, we may not know why God sends us this cross or that one. But we are assured that somehow, it is for our good: “And we know that for those who love God all things work together for good, for those who are called according to His purpose” (Rom 8:28). Our crosses, whatever they be, are always hard to bear—would be impossible to bear without God’s constant and mighty aid. But even if we are not bearing fruit in our wombs, the Holy Spirit is bearing fruit in us. So we wait with patience, trusting that the God who opens and closes our wombs knows best, and knowing that the glorification of our fallen world—and our fallen bodies—is at hand. Katy Cloninger is a freelance copyeditor and the divorced mother of one. She has a BA in English from Newberry College and is a member of Holy Trinity Lutheran Church in Columbia, SC. She loves reading, writing, hearing, teaching, and singing about her Savior Jesus Christ and the marvelous truths of God’s Word. Posted in Abortion, Divorce, How to Care for the Barren, Infertility, Miscarriage, Secondary Infertility, Suffering on August 15, 2018 by Katie Schuermann.